Moorcroft Guardian Angel Discounts Apply ! Emma created Guardian Angel. The first third of the surface of the 4/8 vase represents the era of William with its early pomegranate and cornflower images. In the second third of the surface, it is raining hard on Walter Moorcroft’s Coral Hibiscus and Campanula. Hard times – and it was certainly pouring with rain on the 16th September 1986 when I first walked through the door into Moorcroft. After that, the sun comes out and shines on the third section. Design-lines burst into full bloom with butterflies, fruit, poppies and other colourful flowers. Even the sought-after tangerine pansy makes a welcome cameo appearance! 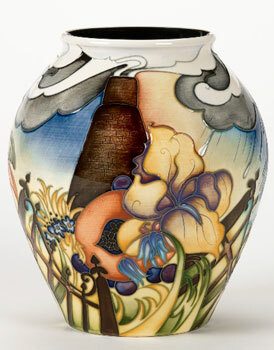 In other words, the three visual sections of Guardian Angel represent Emma’s three ages of Moorcroft.